Now that we are semi-settled in the new house, it's time for some Halloween lunches. For the record, semi-settled means I have less boxes than I started with, not that I'm actually unpacked. Either way, Ben is having bats for lunch! Ben has ham and cheese sandwiches on whole wheat, a coffin decorated with a cheddar bat and an actual bat. For the actual bat, I made the sandwich, then recut the top piece with a slightly smaller bat cutter to make the design pop out better. 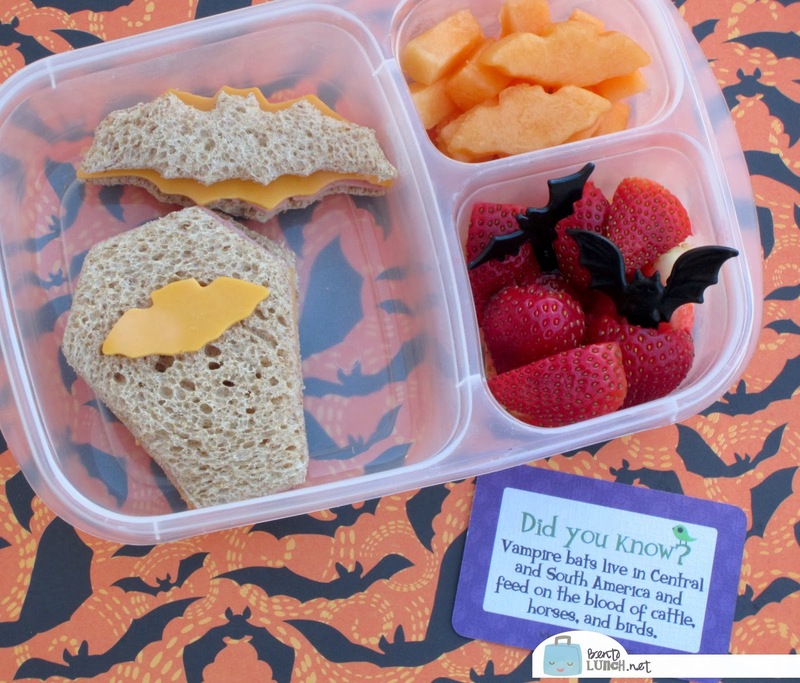 He had cantaloupe, with a few cut into bat shapes and strawberries, accented with bat picks. Not pictured, he took Greek yogurt, a granola bar and applesauce for snacks. The benefit to the morning and afternoon recesses at their charter is that I can send reasonable snacks so lunch isn't their only food till they come home. Lunch is packed in our Easy Lunchboxes and accompanied by a Lunchbox Love note.